Two Rivers Resort RV Park offers 102 RV sites and 32 tent camping sites with beautiful views of Lake Roosevelt. The RV sites are full hook-ups equipped with a barbeque, picnic table, and patio for your summer getaway. The RV Park amenities include restrooms, showers, laundry facilities, and a RV dump station onsite for your convenience. 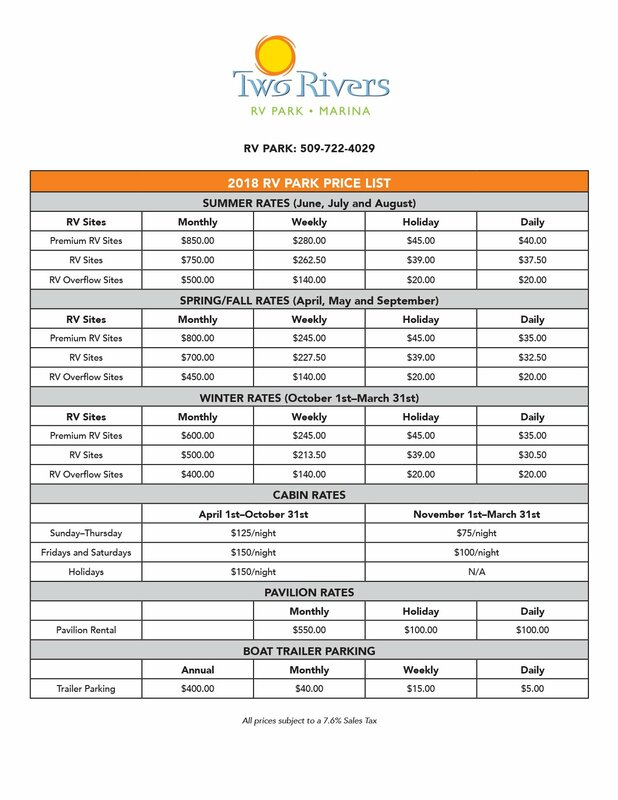 Two Rivers Resort RV Park also features rental cabins, a rental pavilion for your group events, and boat trailer parking. The waterfront cabins overlook the confluence of the Spokane and Columbia Rivers. Each cabin is equipped with air conditioning, full kitchen, private bedroom, satellite TV, wi-fi plus your own deck to sit back on and take in the stunning sunsets. To book your summer fun please call 509-722-4029 or 509-722-5500.